Precast concrete bollards offer a combination of versatile design and robust impact protection. Bollards are available in a range of unique forms suitable for any building or landscape design. Concrete bollards are reinforced with 4- or 6-inch steel pipes for high-impact protection, making them ideal for mixed-use urban environments such as parking lots and other high-traffic areas. Select from a range of robust concrete designs. Exposed aggregate offers a natural stone finish to complement a range of architectural designs, green landscapes and paved areas. Concrete posts are sandblasted without chemicals to expose unique Pacific Northwest granite sourced from British Columbia's Fraser Valley. Concrete bollards are reinforced with 4- or 6-inch steel pipes for effective impact protection, making them ideal for sensitive, high-traffic areas. Install concrete posts in front of building entrances and large windows to protect from vehicle invasions. Bollards also protect vulnerable utility areas and pedestrian walkways bordering roads and parking lots. Concrete is easy to mold. Once cured, it provides durable stone material with exceptional strength and longevity. Concrete is one of the most widely used construction materials in the world. It's used regularly for major infrastructure projects such as dams, highways, bridges and canals. Reliance Foundry's concrete bollards use a high-pressure cement mixture to ensure the best strength and durability to prevent chipping and wear. Steel pipes can be embedded deep into concrete to ensure safety and security of high-traffic areas. 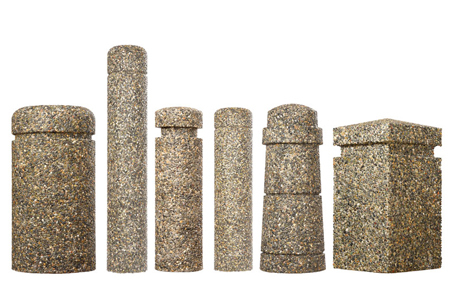 Once set, concrete bollards offer a permanent fixture for long-term protection.